For the fourth time, Chevron has been sanctioned for improper conduct in both U.S. and Ecuadorian courts. The sanctioned behavior ranges from attempting to overwhelm the Ecuadorian court by filing in a short time frame over a hundred motions -- some of which had been filed and ruled upon already -- to asking abusive questions of one of the plaintiffs' experts in an effort to intimidate him. Denver, Colorado (November 19, 2010) – A U.S. federal court has sanctioned Chevron and its lawyers at Gibson Dunn & Crutcher for abusive questioning during a deposition related to the oil giant’s multi-billion dollar liability in Ecuador for environmental contamination, according to court papers made available today. The questioning that led to the sanctions was conducted by Andrea Neuman, one of Chevron’s lead lawyers on the Ecuador matter and a partner at Gibson Dunn’s office in Irvine, CA. Neuman is the fourth Chevron lawyer to be sanctioned recently in the Ecuador matter. Separately, two Chevron employees are under criminal indictment in the South American nation for lying about the results of a purported environmental remediation that Chevron is using as a defense to the civil lawsuit over the contamination, which affects an area the size of Rhode Island. Dozens of indigenous and farmer communities in Ecuador are suing the oil giant for deliberately dumping billions of gallons of toxic waste into Ecuador’s Amazon region when it operated a large oil concession from 1964 to 1990. The contamination – which includes more than 900 abandoned toxic waste pits -- has plunged the region into a public health crisis that threatens thousands of people with cancer and other oil-related diseases, according to evidence before the court. In the brief seeking the sanctions, the Amazon communities accused Neuman of using “blatant intimidation tactics” that “fall below the standards of professional conduct” required by Colorado and Federal rules in Colorado. The questioning occurred when Neuman deposed an American technical expert for the plaintiffs on Oct. 6 in Denver. In a decision dated November 15, Magistrate Judge Michael E. Hegarty ordered Neuman and her colleagues at Gibson Dunn to refrain from asking questions in depositions involving the witnesses’ knowledge of criminal law statutes. Gibson Dunn is trying to characterize the expert work in Ecuador as fraudulent, a charge the Amazonian communities reject. Just days ago a trial judge in Ecuador increased the fine for two Chevron lawyers found to be obstructing the trial. Alberto Racines and Diego Larrea, both of whom have worked on Chevron's legal team in Ecuador since the trial against Chevron began in 2003, were fined approximately $1,600 by Judge Nicolas Zambrano for repeatedly filing the same motions to delay the seven-year case. In 2009, a third Chevron lawyer in Ecuador – Patricio Campuzano -- was sanctioned for the same reason. On August 5 – one day after the Ecuador court ordered both parties to submit their own damages assessments – Chevron filed 19 motions to nullify the order or the trial itself in a 30-minute period. Racines and Larrea then cited the failure of the trial judge to quickly rule on each of the motions as a basis to recuse him. Just last week, Chevron’s Ecuador lawyers filed a long affidavit in court from a U.S. technical expert that was signed in 2004, one year after the trial began in Ecuador. Chevron then asked the judge to appoint a translator though Chevron generally provides its own translations of documents. Chevron, which operated several oil fields in Ecuador from 1964 to 1990, faces damages and clean-up costs of up to $113 billion. The amount includes compensation for an estimated 10,000 potential deaths from cancer in the coming decades, according to reports submitted to the court by a team of prominent American technical experts. Chevron bought Texaco (which owned the Ecuador operation) in 2001 for $31 billion, apparently without adequately vetting the company for the Ecuador environmental liability, said Fajardo. The lawsuit against Chevron, originally filed in U.S. federal court in 1993 but moved to Ecuador in 2002 at Chevron's request, accuses the oil giant of poisoning an area of rainforest that is home to five indigenous groups and thousands of farmers. The two Chevron employees under indictment in Ecuador, Rodrigo Perez Pallares and Ricardo Reis Veiga, have a preliminary hearing on their case scheduled for January 5, 2011 in Quito. Both are accused of defrauding Ecuador’s government by signing false documents certifying a sham cleanup in the mid-1990s. 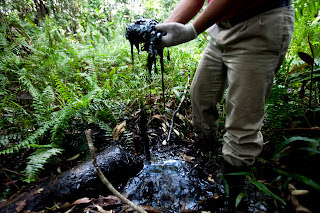 It appears lawyers for Chevron operative Diego Borja are being very careful not to deny the shocking charges that Borja made about the oil giant's evidence tampering in the multi-billion oil contamination lawsuit filed by indigenous tribes in the Ecuadorian rainforest. Two federal judges recently ruled that Borja and his video-taping sidekick Wayne Hansen can be deposed for questioning about their role to undermine the lawsuit. A few days ago Borja's lawyers filed a motion to quash the subpoena. In legal briefs, Borja never denies the charges. Details below. SAN FRANCISCO, Nov. 10 – Self-described Chevron sting operative Diego Borja, scheduled to appear in court today in San Francisco, is conceding that the oil giant “cooked” evidence to defend itself against a multi-billion oil contamination lawsuit in the Ecuadorian rainforest, according to documents filed in court. Borja’s lawyers today are scheduled to argue their motion to quash a subpoena requiring Borja to produce evidence relating to Chevron’s operations in Ecuador, where he said he ran a “dirty tricks” operation for the oil giant. Borja has emerged as a key figure in the Ecuador lawsuit – where Chevron faces damages of up to $113 billion -- after he was caught on tape saying the oil giant “cooked evidence” to produce lower levels of toxic contaminants. Lawyers for the plaintiffs have long charged that Chevron is violating the law in Ecuador by trying to undermine the trial, which is in the South American nation at Chevron’s request after it was filed in U.S. federal court in 1993. The vast majority of the voluminous scientific evidence in the trial points to Chevron’s culpability for massive oil contamination throughout an area the size of Rhode Island. The contamination is producing high rates of cancer and other oil-related diseases and has decimated indigenous groups, according to evidence before the court. Chevron has repeatedly announced it expects to lose the case, and instead has attempted to persuade its shareholders that it can avoid enforcement of the judgment by claiming that the the court and the Ecuadoran legal system are not legitimate. In papers filed with the federal district court in San Francisco, Borja’s lawyers do not deny that he made the claims the oil giant “cooked evidence”. Instead, they argue the statements are not relevant to the international arbitration claim between Chevron and the government of Ecuador, which is the legal basis for the subpeona. U.S. District Judge Edward M. Chen earlier had ordered Borja to appear for a deposition, writing that there is evidence “suggesting that Mr. Borja was not an innocent third party … but rather was a long-time associate of Chevron whom Chevron would pay for any favorable testimony." Borja was caught on tape last year telling a friend that Chevron had “cooked evidence” and that he had incriminating information that if known would cause Chevron to lose the lawsuit. Borja threatened to reveal the incriminating evidence if the company did not pay him for videotapes he secretly recorded with an accomplice that attempted to discredit the Ecuadorian judge presiding over the case. Chevron later relocated Borja and his family to the United States at the company’s expense, where he remains on Chevron’s payroll while living in a luxury house in a gated community. Chevron is paying the fees of his lawyers. Hansen, who is a convicted drug trafficker who served time in prison, also has been ordered to appear for a deposition but appears to have fled California and has not been served papers, according to sources. For more information about Borja and Hansen’s sting operation, see http://chevrontoxico.com/news-and-multimedia/borja-report/. · Borja and his Chevron “boss” attempted to infiltrate a laboratory used by the plaintiffs using false names. The tapes of Borja, made by an Ecuadorian man named Santiago Escobar, have been turned over to authorities in Ecuador and the United States. Escobar has said that Borja indicated to him that he carried out a series of clandestine “dirty tricks” operations for Chevron in Ecuador. Escobar said Borja told him he arranged “the biggest business deal of his life” that would “take down the lawsuit” and that he had received a “ton of money” from Chevron for his work. From 1964 to 1990, Chevron dumped 18 billion gallons of toxic formation water directly into the rainforest instead of re-injecting it deep into the ground, the standard practice during this time in the United States and other countries. Without regard to the impact upon the environment and human health, Chevron designed this practice to save money. When Petroecuador took over the oil sites, the government-owned oil company began re-injecting all formation water, and today that practice continues. The press release below features a former Chevron oilfield worker who describes how the oil giant contaminated the drinking water and soil. LAGO AGRIO, Ecuador (Nov. 8, 2010) – A former Chevron oilfield worker has described in graphic detail how the company ordered its employees to systematically dump toxic waste into the waterways of the Amazon rainforest, according to representatives of the communities suing the oil giant. In a video posted on the at website of the environmental group Amazon Watch, a former Chevron oilfield worker Jhinsop Martinez Erraez offers an eyewitness account of his employer’s criminal conduct. Erraez said the company conducted wholesale dumping of toxic waste products and industrial chemicals directly into the Ecuadorian rainforest from 1964 to 1990. The revelations came in the second video posted by Amazon Watch that confirms Chevron’s oilfield misconduct in Ecuador, where the company faces a multi-billion dollar liability in a case brought by dozens of indigenous and farmer communities. The first video, also available here, documented how the company abandoned hundreds of waste pits that piped toxic waste into rivers and streams relied on by the local inhabitants for their drinking water. Martinez had been an assistant for oil production operations at Dureno 1, one of the 378 well sites and oil production facilities built and operated by Texaco throughout an area of rainforest roughly the size of Rhode Island. “And that was the routine we had twenty-four hours a day, taking care of that well,” Martinez said. According to its own environmental audits, Chevron discharged at least 18 billion gallons of the “produced water” that Martinez describes in his interview. Produced water contains cancer-causing chemicals such as benzene, toluene, xylene and Polynuclear Aromatic Hydrocarbons (PAHs). Martinez worked for Chevron in the late 1980s, shortly before its contract with Ecuador’s government expired in 1992 and the company left the country. The lawsuit was filed in U.S. federal court in 1993 and moved to Ecuador in 2002 after Chevron agreed to accept jurisdiction there and abide by any judgment. The top end of Chevron’s damages is estimated to be as high as $113 billion, according to a report submitted by six prominent American technical experts. While Chevron does not dispute that it dumped the “produced water” as Martinez said, the company has said on multiple occasions that the toxic waste was treated before discharge. This claim is sharply contradicted by Martinez. Martinez’s statements are significant because as early as the 1930s it was standard oil industry practice in the United States to re-inject “produced water” deep underground rather than discharge it directly into the environment, where it could contaminate fresh water sources. Some “produced water” is discharged in the U.S. today, but only under a strict permitting process to guarantee that it does not contaminate water sources. According to Martinez, neither of these approaches were utilized at Dureno 1 even though Chevron owned the patent on the technology used for underground reinjection. Evidence before the Ecuador court demonstrates that Chevron’s dumping at Dureno 1 was replicated at all of the company’s production sites in Ecuador, said Pablo Fajardo, the attorney for the plaintiffs. “It is clear that Chevron is responsible for the destruction of an entire region’s environment on which thousands of people depend for their sustenance,” said Fajardo. Several peer-reviewed health evaluations have found elevated rates of cancer in the area where Chevron operated. One American expert, formerly associated with the RAND Corporation, authored a report report, concluding that up to 10,000 people faced a significant risk of contracting cancer in the coming decades because of the pollution. “An entire generation has been forced to live with the reality of elevated risks of cancer, childhood leukemia, spontaneous abortions, and birth defects simply because Chevron didn’t want to spend the money to operate the way it would have in the United States,” said Fajardo. Several experts believe the damage caused by Chevron in Ecuador dwarfs the harm generated by the BP Gulf spill, and is probably the world's largest oil-related disaster. The contamination will take at least a decade to remediate once funds are in place, according to experts. A complete video of the Martinez interview, and associated transcripts is available here. How Big A Lie Will $8 Million Buy? Han Shan of Amazon Watch answers the question of how big a lie $8 million will buy. He writes an interesting blog about a Chevron consultant who says the oil giant has never harmed the environment or human health in its oil exploration. Chevron has paid him at least $8 million, of which $5 million was for reports that said none of Chevron's contamination in the Ecuadorian rainforest is harmful to humans and environment. Along with our campaign allies at RAN & the tricksters at The Yes Men, we've been having some fun exposing Chevron's widely-panned new 'We Agree' ad campaign for the insulting greenwash it is. But now, I want to turn back to some serious matters in the ongoing legal battle to hold Chevron accountable for massive devastation in Ecuador's Amazon rainforest region. The Amazon Defense Coalition (ADC) issued a press release a few weeks back that highlighted a legal judgment against Chevron in Mississippi this past Spring. A jury verdict says that Chevron must pay $19 million dollars to five plaintiffs who were exposed to leaded gasoline fumes from leaking underground gas tanks owned by the company. According to the Associated Press, the daughter of the lead plaintiff in the lawsuit was born "severely mentally disabled, and the children of the other women suffer from respiratory conditions and learning disabilities." What does this have to do with Ecuador and the mothers and children there who say Chevron is poisoning them? Well, it was Chevron’s lead American expert in the Ecuador case John Connor who also testified in this recent Mississippi case. The U.S. jury rejected Connor's testimony, and a reading of the court transcriptunveils some very damning information. Connor also tried to exonerate Chevron by testifying that any contamination must have been caused by leaks from three storage tanks owned by a smaller company in the area, not the larger tanks owned by Chevron. But when confronted on cross-examination by evidence that he had misidentified the site from a state database, Connor admitted that he had never taken any steps to definitively verify that the gas tanks actually existed on the smaller company’s property. John Connor: "Chevron paid me well to tell you this oil poses no danger to anyone." Connor's testimony in Mississippi is very similar to his under-oath spin in the Ecuador case, intended to shore up Chevron's ludicrous argument that Ecuador's state oil company Petroecuador is responsible for all of the oil contamination in the region. This, despite Chevron admitting that it dumped more than 18 billion gallons of toxic wastewater into Amazon waterways depended upon by thousands of local people for drinking and bathing. This, despite the fact that Chevron (in the form of its subsidiary Texaco, of course) dug every one of the 900+ toxic waste pits that the company abandoned, many of which continue to leech poisons into the soil and ground water [see this video to understand exactly how that happens]. Under cross-examination in Mississippi, Connor also admits that Chevron has paid him "at least" $8 million over the years and estimates that $5 million of that has been for his work in Ecuador. Ordering Chevron to pay $19 million in damages, a jury in Mississippi rejected his ludicrous and laughable testimony and concluded that this guy has no credibility. And I encourage you, dear reader, to read the transcript. Even on paper in a format as weird as a court transcript, he sounds evasive and slippery at best, and like he's simply lying through his teeth at other times. Now, people who are following the monumental class action in Ecuador will know that Chevron has been in a legal frenzy over the last few months, filing legal actions against more than 20 people on the plaintiffs' side demanding 'discovery' ranging from turning over footage and files to sitting for depositions conducted by Chevron lawyers. The plaintiffs, busy dealing with this legal onslaught by a company with nearly bottomless resources, have yet to be able to truly fight fire with fire and seek discovery from Chevron in the same way. In September, a U.S. judge granted a request by the government of Ecuador to subpoena Chevron's self-avowed 'dirty tricks guy' Diego Borja. Borja, of course, was captured by a friend-turned-whistleblower talking about how the company "cooked evidence" in the trial in Ecuador, and suggesting that his "bosses" at the company were directing him. Now, it's time for the plaintiffs to drop some subpoenas on some of these Chevron "bosses" so we can learn the truth about the dirty tricks and lies that Chevron has been employing to evade accountability for its devastation in Ecuador. But the more I learn about Chevron's highly-paid and deceitful "expert" John Connor, I think he may be the perfect place to start. Last week Judge Nicolas Zambrano ruled that Chevron lawyers Alberto Racines and Diego Larrea tried to obstruct the multi-billion lawsuit the oil giant faces in Ecuador by repeatedly filling the same motions in an apparent effort to stall the case. Another Chevron lawyer Patricio Campuzano was sanctioned for the same reason in 2009. On August 5th, Chevron filled 19 motions to repeal the court’s order to submit new damages assessments and later argued the judge’s failure to rule quickly on those motions was a reason to recuse him. Given Chevron’s charges that previous damage assessments were fraudulent, one would think the company would welcome an opportunity to submit its own. Instead, facing a potential $113 billion liability, Chevron files a bunch of old motions already denied. Lago Agrio, Ecuador (October 29, 2010) -- A trial court has sanctioned and fined three Chevron lawyers for obstructing the trial where Chevron faces a multi-billion dollar judgment for the deliberate dumping of 18 billion gallons of toxic waste, according to court papers made available today. Alberto Racines and Diego Larrea, both of whom have worked on Chevron’s legal team in Ecuador since the trial against Chevron began in 2003, were fined by Judge Nicolas Zambrano this week for repeatedly filing the same motions in an effort to delay the seven-year Ecuador trial. The judge ruled that the lawyers had used Chevron’s motions “to obstruct the trial.” In 2009, a third Chevron lawyer – Patricio Campuzano – was sanctioned for the same reason. On August 5 – one day after the court ordered both parties to submit their own damages assessments -- Chevron filed 19 motions to nullify the order or the trial itself in a 30-minute period. Racines and Larrea then cited the failure of the trial judge to quickly rule on each of the motions as a basis to recuse him. “The evidence clearly shows Chevron used illegal practices that resulted in the massive destruction of the rainforest in Ecuador and the decimation of indigenous groups and other local residents,” said Pablo Fajardo, who represents dozens of indigenous and farmer communities suing the oil giant for dumping more than 18 billion gallons of toxic waste into the Amazon rainforest. “To help Chevron evade its obligations, Chevron’s lawyers are trying to sabotage the Ecuadorian legal system in addition to violating their professional obligations,” he added. Chevron, which operated several oil fields in Ecuador from 1964 to 1990, faces damages and clean-up costs estimated at up to $113 billion. The amount includes compensation for an estimated 10,000 potential deaths from cancer in the coming decades, according to reports submitted by a team of prominent American technical experts. Chevron is also accused of deliberately discharged highly toxic “water of formation” into the waterways of the forest that thousands of local residents depended on for their drinking water. The “water of formation” has a salt content ten times greater than ocean water. Chevron bought Texaco (which owned the Ecuador operation) in 2001 for $31 billion, apparently without adequately vetting the company for the Ecuador environmental liability, said Fajardo. The lawsuit, filed in U.S. federal court in 1993 but moved to Ecuador in 2002 at Chevron’s request, accuses the oil giant of poisoning an area of rainforest the size of Rhode Island that is home to five indigenous groups. More than 900 unlined toxic waste pits built and abandoned by Chevron are spread out through the rainforest where they continue to contaminate groundwater and soils, according to evidence submitted to the court. Chevron has repeatedly tried to delay the trial by bombarding the court in the Amazon town of Lago Agrio with hundreds of repetitive motions, a practice that has intensified in recent months. Two Chevron employees currently living in the United States, Ricardo Reis Veiga and Rodrigo Perez Pallares, are under indictment in Ecuador for lying about the results of purported remediation in the mid-1990s. Evidence gathered during the trial shows that toxic waste pits the company claimed to have remediated are contaminated with cancer-causing toxins, sometimes hundreds of times higher than U.S. and Ecuadorian norms designed to protect public health. Chevron’s misconduct in Ecuador and its abuse of the legal process has drawn increasing criticism. A prominent Ecuador Bishop, Gonzalez Lopez Maranon, blasted the oil giant for failing to accept responsibility for the “pollution and death” Texaco caused in the country. The full text of his letter in English and Spanish, which was sent to the U.S. Conference of Catholic Bishops, can be found here. Rep. James McGovern, the only member of Congress to have visited the disaster area in Ecuador, previously had written a letter to President Obama saying Chevron’s pollution had created “a terrible humanitarian and environmental crisis.” Dozens of members of Congress also have protested Chevron’s attempts to lobby the Obama Administration to cancel Ecuador’s trade preferences as retaliation for the lawsuit. Just last week, Chevron’s new $100 million advertising campaign was widely mocked by environmental groups and the Yes Men, who created a website called www.chevronthinkswerestupid.com.